In our second Daily Insights from Mobile World Congress we look at highlights from the recent announcements at the show. CCS Insight will publish several more-comprehensive reports in the days after the show closes. 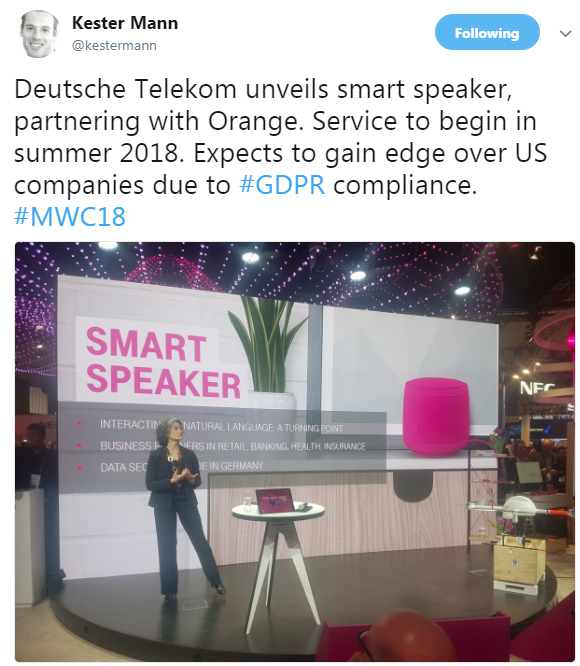 Deutsche Telekom unveiled a new voice assistant service and dedicated smart speaker. The service will be available in mid-2018 to assist customers in their use of Deutsche Telekom services within the home. It is activated by saying "Hello Magenta". The operator emphasised that it does not intend to compete with services such as Amazon's Alexa, and sees the move as complementary to them. It suggested that challenges for US companies in trying to conform to European data protection laws represent a major opportunity for providers such as Deutsche Telekom to gain an advantage. In a separate announcement, the operator announced that Europe's first integrated satellite and LTE network is ready to use following a partnership with Nokia and Inmarsat. The service, supported by the deployment of nearly 300 base stations in 30 European countries, can offer air passengers connection speeds of up to 75 Mbps and latency of 100 milliseconds. This niche of devices is in evidence at the show, with several companies hoping to take a slice of the market. CCS Insight forecasts that unit shipments of rugged phones will double from 30 million in 2017 to more than 59 million in 2021 (see Market Forecast: Rugged Mobile Phones, Worldwide, 2017-2021). 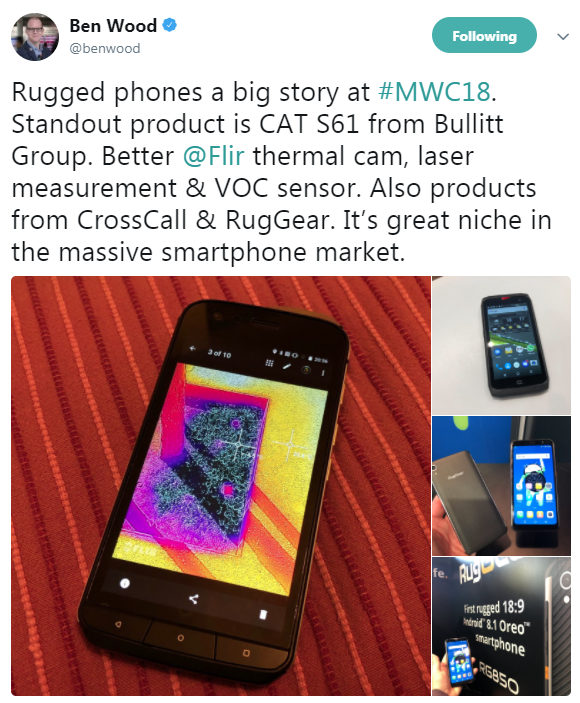 Foremost among the exhibitors is Bullitt Group, showing off its new Cat-branded S61 smartphone. The new model builds on the success of its S60 predecessor with a larger screen, an enhanced FLIR thermal imaging camera, laser-assisted measurement sensor and an indoor air quality sensor. Other notable manufacturers in this space include France's Crosscall and the UK's RugGear. MediaTek's announcement of the Helio P60 sees the Taiwanese chip designer further addressing its mid-tier weakness and loss of market share to Qualcomm over the past two years. The Helio P60 follows the recent announcement of the octa-core Helio P23 and Helio P30, but opts for greater processing power by adopting Arm's big.Little architecture with four Cortex-A73 cores and four Cortex-A53 cores. It is also MediaTek's first chipset to include its NeuroPilot artificial intelligence platform, announced at CES 2018. Built on TSMC's 12 nm process node, the Helio P60 claims up to 70 percent improvement in performance over the P23 and P30. However, the presence of the same modem in the P60 as in the P23 and P30 — offering LTE Category 7 downlink — means the P60 remains firmly targeted at the mid-tier. MediaTek now has a raft of new chipsets that will play a crucial role in re-establishing its market share among Chinese manufacturers. Nonetheless, CCS Insight still believes that connectivity is a significant weakness for MediaTek that Qualcomm is likely to further expose. 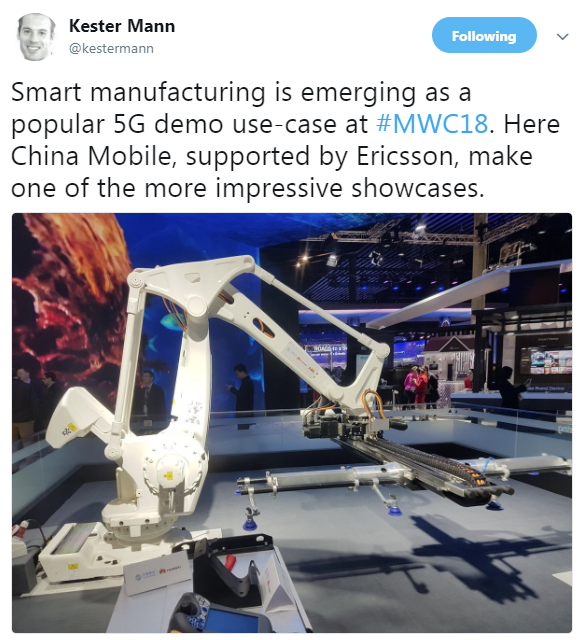 China Mobile announced a partnership with Ericsson, through which it aims to expand its efforts in 5G and the Internet of things in manufacturing, healthcare, transportation and other sectors globally. The progress of adopting sensors, artificial intelligence and cloud technologies in manufacturing is notable, as demonstrated on China Mobile's stand. China is on a roll to become a world leader in artificial intelligence and 5G, and progress in industrial applications of the Internet of things is one of the directions that this endeavour takes. CCS Insight predicts that China will surpass the US in leadership of artificial intelligence technology by 2022 (see CCS Insight Predictions for 2018 and Beyond). 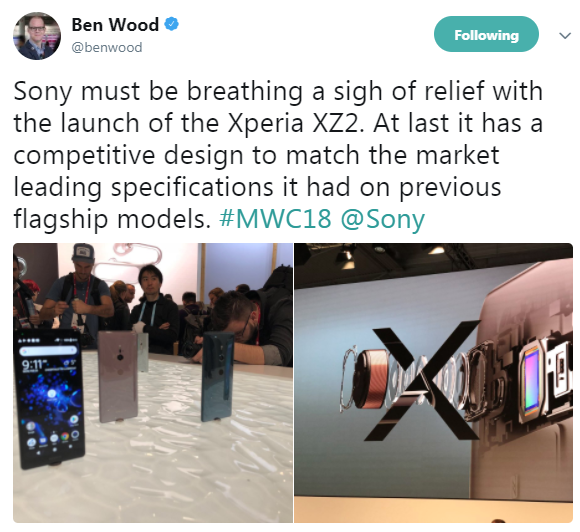 Sony unveiled the Xperia XZ2 and the Xperia XZ2 Compact. The company must be breathing a sigh of relief with the launch of these new devices. At last it has a competitive design to match the market-leading specifications of its previous flagship models. It will be rueing a missed opportunity in 2017 when it beat rivals such as Samsung by a full year to incorporate features such as slow-motion video capture. In the end Sony was held back by a design with an uncompetitive large bezel that was out of step with rival products. Sony's Compact range of smartphones has proved popular over the years. As Apple has shown with the iPhone SE, there is still a market for a smartphone that fits easily in the hand. The good thing about the Sony XZ2 Compact is that unlike the iPhone SE, it doesn't compromise on specifications. The XZ2 Compact comes with most of the same features as its big brother. However, Sony faces the same uphill challenge as most smartphone makers. As phones all start to look similar, success often comes down to marketing expenditure and brand. Taking on Apple and Samsung requires eye-watering investment that the likes of Sony, as well as HTC, LG and others, are always going to struggle with. Car-maker Seat announced an agreement to integrate Shazam's music identification technology into its vehicles. In our view, it's a good deal for both companies. Car companies are seeking to enhance value, with a lot of recent focus on in-car connectivity and a wealth of connected services. 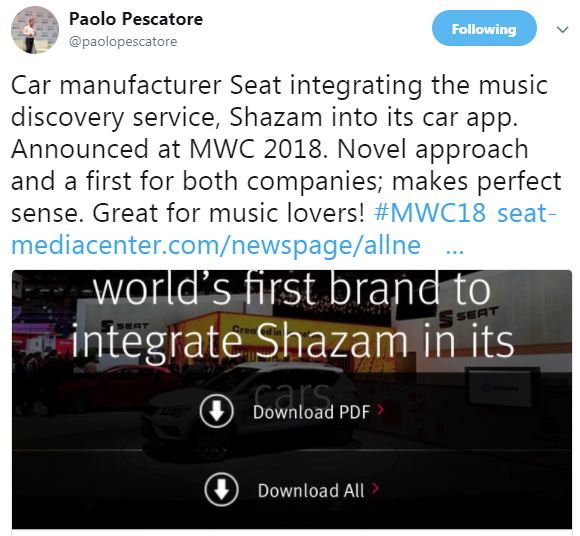 For Shazam, the connected car offers another opportunity to grow its presence on all screens. The move also advances the position of Shazam's new owner, Apple, which has its own aspirations in the automotive sector. We expect Apple to integrate Shazam technology in its own products and services. The agreement will also give those involved greater understanding of consumer behavioural patterns. 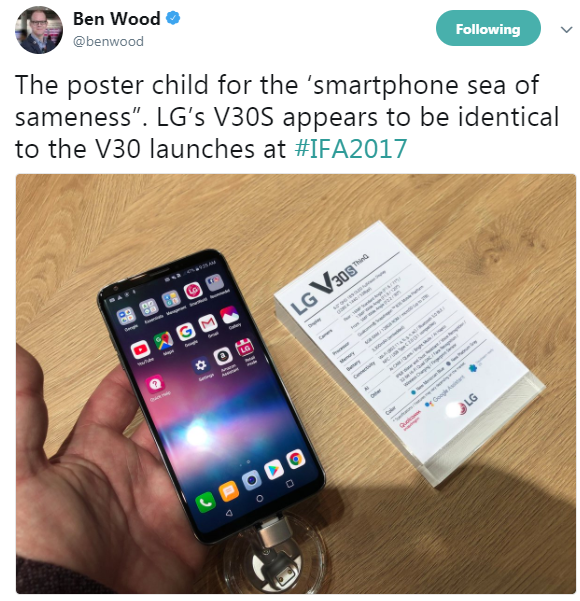 LG revealed the V30S ThinQ smartphone — a variant of the V30 device announced at CES 2108 with more memory, some camera improvements and the application of LG's ThinQ artificial intelligence branding and technology. Like so many manufacturers, LG is trying not to drown in the sea of smartphone sameness that has rendered nearly every new model indistinguishable from the last one. At Mobile World Congress, LG has taken the concept to the next level by applying a lick of AI paint to a current device and hoping to ride the wave of hype whipped up by artificial intelligence. The company's goal of uniting its efforts in smart devices under the ThinQ banner may be admirable, but it's unlikely to change the fortunes of the V30(S). 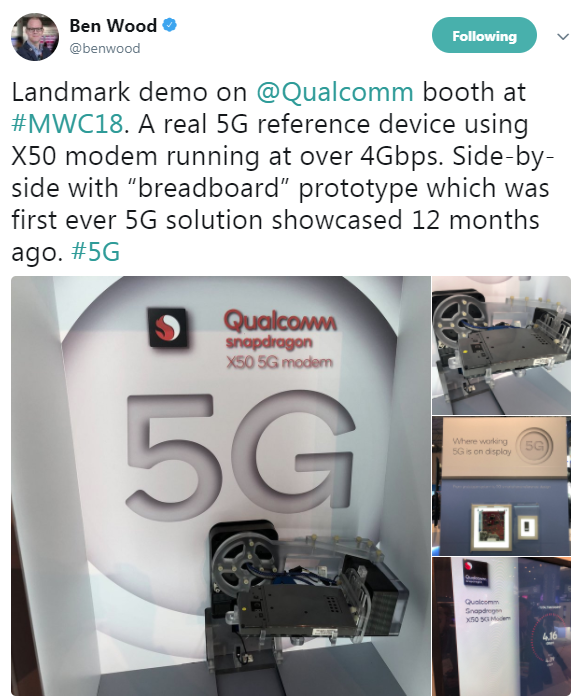 In an important step toward network launches and commercial 5G devices in 2019, Qualcomm announced that 18 operators and 20 manufacturers have selected its X50 modem for mobile 5G New Radio trials. The manufacturers have pledged to launch devices using the X50 modem in 2019. A critical view of the list of network operator partners would argue that standards-based trials will see multiple carriers, infrastructure and silicon providers all involved, and a long list is not necessarily indicative of ultimate commercial success. For example, Intel also has multiple operator partnerships. However, CCS Insight believes that the size and scope of these engagements underline Qualcomm's strength as the industry transitions to 5G. This is particularly pronounced in terms of manufacturer agreements. Qualcomm is a default partner for all but a minority of device makers given the importance of integration, performance and time to market. Apple, Huawei and Samsung were absent from the press release, although it should be noted that Qualcomm recently signed a broader strategic agreement with Samsung. The signs are clear that Qualcomm will maintain its strength on the path from 4G to 5G. Facebook established the Telecom Infra Project in 2016 to advance open-source efforts in network equipment and deployment. In Barcelona, several operators announced they were joining the group, including China Unicom, Sprint Telefonica and Telenor, taking the total to more than 500 members. Facebook and other Internet giants have a fractious relationship with network operators, so swelling the group to more than 500 members in less than two years is a strong endorsement for the project. However, network operators are no strangers to open standards, partnerships and industry consortia. They will also be mindful of the potential of Facebook's project to reduce deployment costs in the run-up to 5G. We welcome such approaches, but if the project is to pay more than lip service to collaboration and cooperation, it must demonstrate tangible progress soon.